Your name is called, your friends cheer, and you step onto the stage, wondering if maybe that third margarita wasn’t such a good idea. But liquid courage has made you ready to spend the next four minutes killing it as Def Leppard, Miley Cyrus, or Frank Sinatra. And you’re pretty sure you sound amazing. Ah yes, karaoke. It’s the night when anyone can be a rockstar, and talent is optional. But what is karaoke like from the DJ’s perspective? 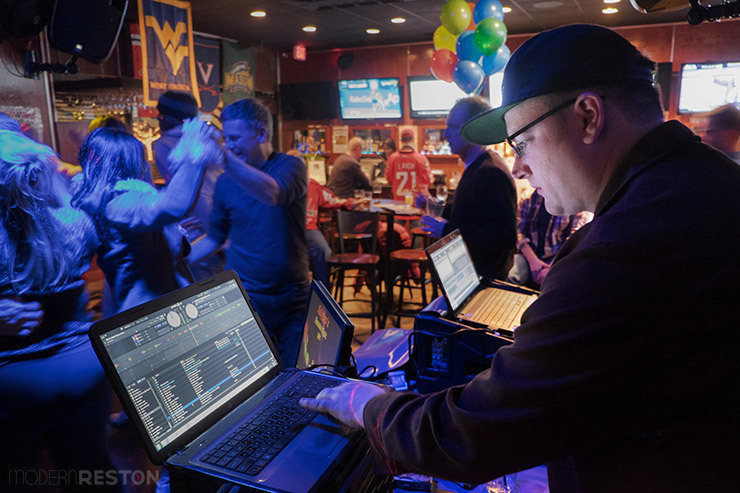 To find out, I visited Kalypso’s Sports Tavern and spoke with DJ John Coulter (DJ JC), who hosts a karaoke event there every Wednesday night. 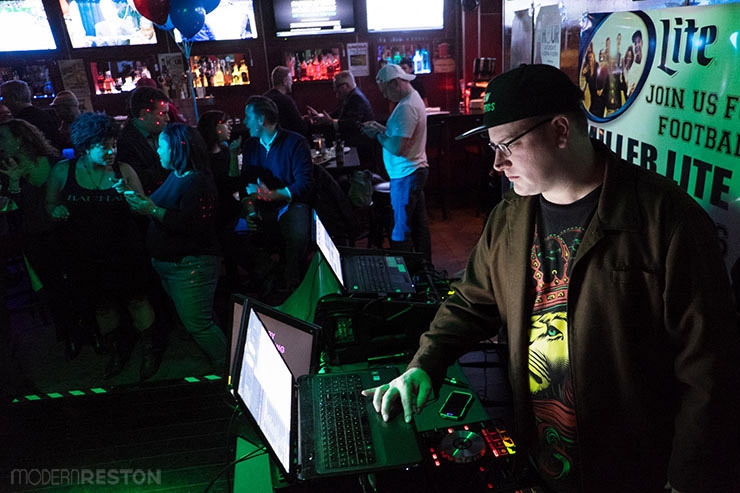 John is a skilled DJ and hip hop artist who puts on a popular show of karaoke, combined with occasional mixed dance music and his own musical performances. 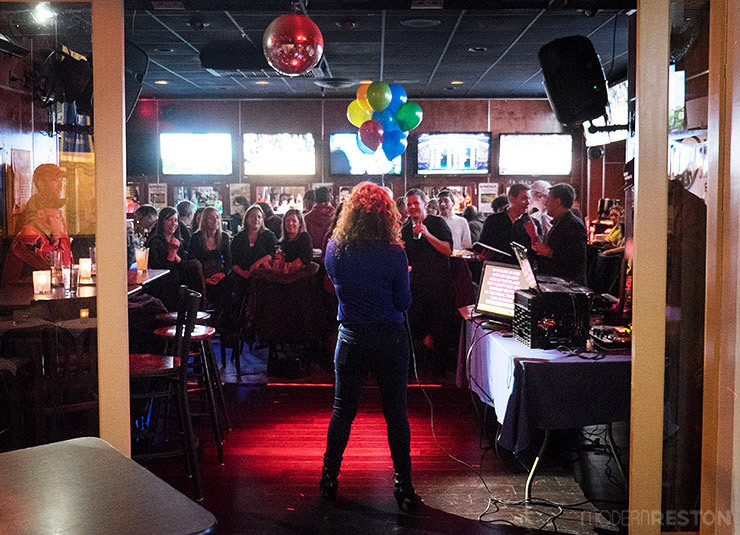 Reston locals love Kalypso’s karaoke nights, myself included. It’s a total blast, and DJ JC is a major reason for that. John is hilarious and fun to chat with. I asked him if there was any advice he could pass on to karaoke singers, and he laughed and said there are all kinds of things he wished people knew. I imagine he has seen some brilliant performances over the years, as well as comically regrettable ones. So what advice does this pro have for the rest of us? Please tell us a bit about yourself, your background, and the DJ work that you do. When I was five, everyday after school my babysitter would take me to work. It was the early ’80s, and my babysitter’s job was DJ at the skating rink. I ran (skated) wild with my ears open. I always wanted to be a DJ after that, especially after hearing what the possibilities were when I heard “Wheels of Steel” by Grandmaster Flash and mixes by DJ Jazzy Jeff on old Fresh Prince tapes. I typically run a karaoke show once a week, but I usually find open time to mix during those nights as well. How often do you do karaoke nights? Do you do them in places other than Kalypso’s? Kalypso’s is home but I may work another place soon in Fairfax on Mondays; Blue Iguana I am looking at you! I am a once or twice a week karaoke host; it’s all I can handle. By comparison, I will do anywhere between four and seven DJ events a week with a smile. I work more DJ events per year than days in the year because the area provides government, school, and corporate clients. Could you name a few songs that are usually crowd-pleasers? How about a few songs that don’t usually go over well in the crowd? Crowd pleasers are tricky. A person could walk in and think that “Don’t Stop Believing” is a can’t-miss, but what if someone sings it every week and the regulars and staff are beating their heads on the table in response? The same can be said with “Livin’ on a Prayer” by Bon Jovi (is there a fraternity in my midst? ), “I Will Survive” (cougar alert), etc. Karaoke that seems to go over well is when someone pulls something out and dusts it off and makes it theirs. It’s okay to sing the super popular stuff; just don’t expect points for originality. I warn against everyone trying to top each other with ballads — it might be fun for those participating, but the slow pace of that kind of music puts the rest of us to sleep. If I get three or four in a row, I am likely to jump the list and give the microphone to someone who has something more upbeat to sing. Do you have tips for giving a good performance? Know the song before you get up there. If you can’t sing well, work that whole stage. Don’t be afraid to try something in a lower octave or higher octave if it isn’t your range. Never quit midway through when it’s difficult. That is the best time to learn how to overcome the difficulty, either by: a) finally getting it and nailing the last verse or chorus, or b) reinterpereting the song and making it your quirky version. There’s more than one way to sing something — for example, check every anthem sung at sporting events. What are some songs that should be left to skilled singers? I have yet to hear someone sing Michael Jackson convincingly. Whitney Houston’s version of “I Will Always Love You” (originally by Dolly Parton) is not for the novice. Anything by Journey is difficult. Believe it or not, most rap songs are difficult, because the words fly by on the screen faster than people can read, process, and say — so if you don’t have it memorized, don’t think its easy. Is there anything people should know about how to treat your equipment? DO NOT EVER DROP THE MIC. Don’t swing it by the cord, either — it loosens the connection, and you aren’t David Lee Roth (yet). David Lee Roth could swing my mic, drop it, and kick me in face, and I would be cool with that. Do you have any insider secrets you’re willing to share about what karaoke night is like from your perspective? Karaoke hosts would love to have a normal conversation and be part of the crowd. We don’t want to spend 20 minutes discussing your next song. If four people did that, and four people got the typical three songs in a night, the host would literally not get to talk to anyone else. I want you to pick your next song. I cant skip anyone in line to put you on, especially if you aren’t a regular, and even then it’s rare. People are waiting patiently and watching me like a hawk — they will know. If you are a karaoke host, don’t expect to sing every rotation. If you think the show is about you just because you run it and people show up, then I firmly believe you are a narcisisstic idiot. You don’t have the space. You need a second article. What else do you want people to know? Spill it, please. Most karaoke hosts want to be a musician or performer for a living; I am not exception. I make hip hop for grownups. My music is at www.soundclick.com/thatcatjc. I can be found on youtube as well at https://www.youtube.com/user/thatcatjc1/videos. Big thanks to John Coulter for guiding all of us karaoke wannabes. We need all the help we can get. As John mentioned, he is also a musician who writes and performs hip hop. You can catch one of his recent videos here, produced by Aaron Couch of MixMe. Finally, here are two more karaoke patrons at Kalypso’s. 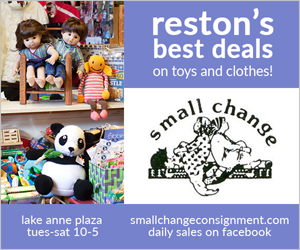 Rumor has it that they are co-founders of Modern Reston. My sources cannot confirm that. Ah! The pressure! I really like ballads!! Maggie, you’ve got to come join us sometime. I wanna see those ballads.